Have I told you yet that September is National Preparedness Month? Oh yes, this is one of my favorite times of the year because we get to have so much fun with preparedness for a whole month! To celebrate, I have a bunch of great giveaways lined up for you this month, and today’s giveaway prize is an All American Sun Oven. These solar ovens are top of the line, super easy to use, and all you need to cook dinner in them is a sunny day. 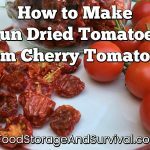 Also included is the dehydrating and preparedness accessory package with drying/baking racks, two stacking pots, two loaf pans, and parchment paper. Super nice setup to get you prepared for powerless cooking! 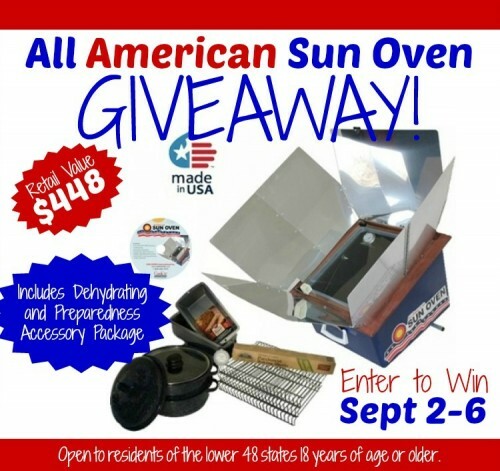 This All American Sun Oven Giveaway is open to any resident who is 18 years of age or older who lives in one of the 48 US Contiguous States. This giveaway starts on Tuesday, Sept. 2nd at 5:00 am (MDT) and ends on Saturday, Sept. 6th at 5:00 pm (MDT). The winner will be notified by email and will have 24 hours to respond. If we do not hear back from said winner in the designated time period of 24 hours we will choose another winner and they will have 24 hours to respond from the time the notification email is sent. Please enter using the form below with an email you check regularly and check your SPAM email folders. Good luck to everyone!